When I was going to sleep Sunday night, I checked VIA's web site for the current position of VIA 1 and 2, the west and eastbound "Canadian" trains. They have been consistently late all winter and this spring has been no different. VIA 2 is due in at 20:45 on Sunday night, but last night it was showing an arrival time of around 06:30 or around 10 hours late. 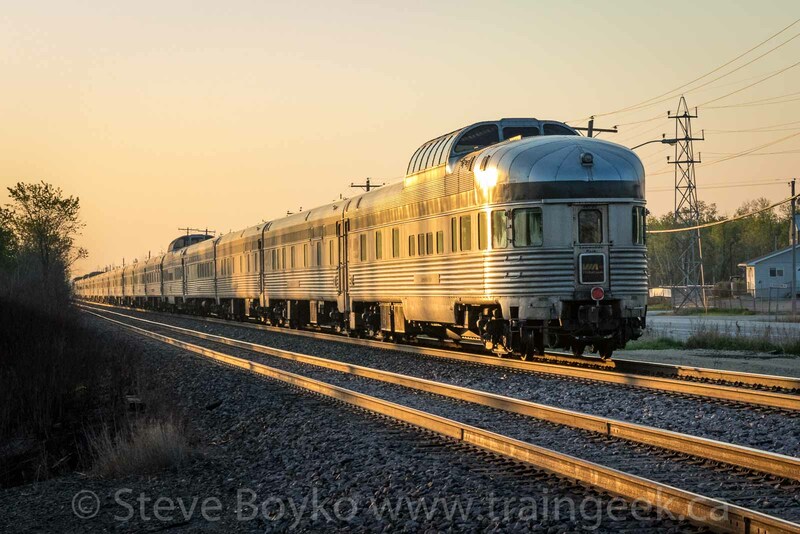 I decided to get up a bit early on this Victoria Day Monday to see if I could catch it coming in at sunrise. Eastbound trains at sunrise... nice. I woke up at 05:25 and checked the web site, and sure enough, it was showing a 06:45 arrival. I threw on some clothes, left a note for my wife (who sadly is working today), and hit the highway. I figured I would get to the CN line, then head west to Diamond to wait there for VIA 2 and shoot it in the wide open prairie. As I took the exit for Wilkes Avenue, that plan was shot all to heck when the lead engines of VIA 2 shot by the nose of my car. I took a hard right and brought my Civic up to speed in pursuit of VIA 2. Since they were within city limits, they were down to a reduced speed, so it was actually possible to catch up to them. I'm not sure what the speed limit for them is, but I overtook them in the 90 km/hr zone and crossed the tracks at Elmhurst Road. I pulled to the side, threw the car in park, and jumped out with my camera and sprinted to the crossing. As I arrived, the lights started flashing and the bell started ringing. This didn't deter one approaching motorist, who gunned it through just before the gates started to drop. VIA 6449 and company looked pretty good in that morning light! 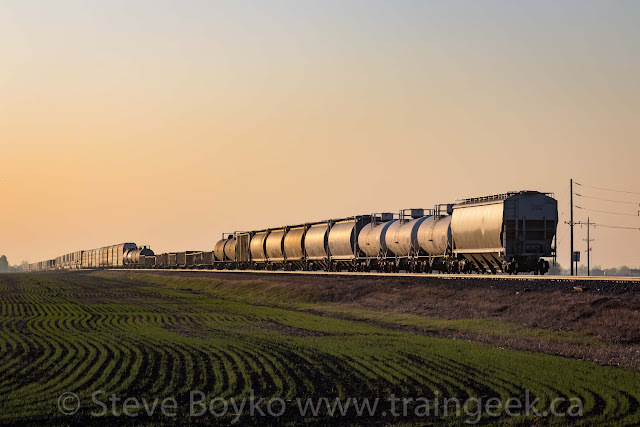 I fired off several frames as the train approached, then banged a shot off for every car so I could get the full consist. There's no art in the recording of numbers, just a quick pan and click for every car to get the number or name off the side. Back to "art" mode for the "going away" photo, the EVANGELINE PARK looking very nice in the golden sunrise. It wasn't the location I wanted, but you take what you can get, and I'm glad I actually caught VIA 2 this time. I tried this stunt a week or two ago and missed VIA 2 by about 30 seconds, so I'm grateful that I "got the shot". 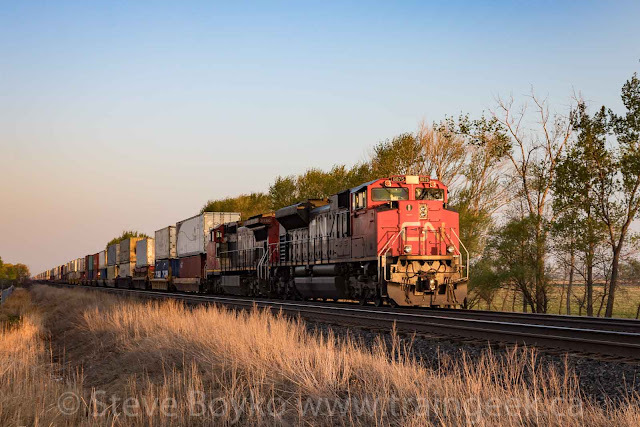 After the adrenaline faded, I headed west along the CN line to see if anything else was around. 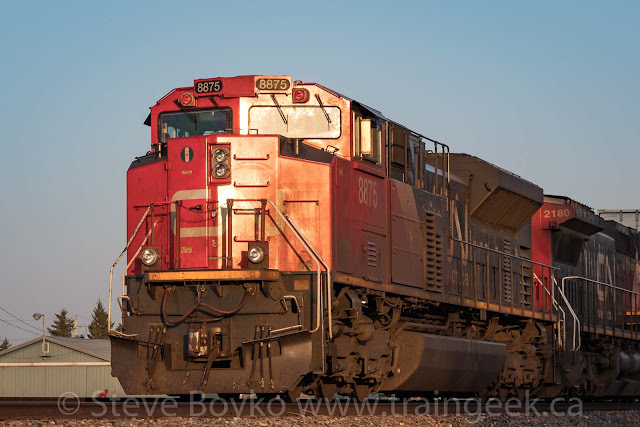 CN 8875 East was stopped just short of Hall Road, presumably waiting for their turn to enter Symington Yard. That face... these SD70M-2s mean business. There's no curves anywhere, just brute power. This train wasn't going anywhere for a while. 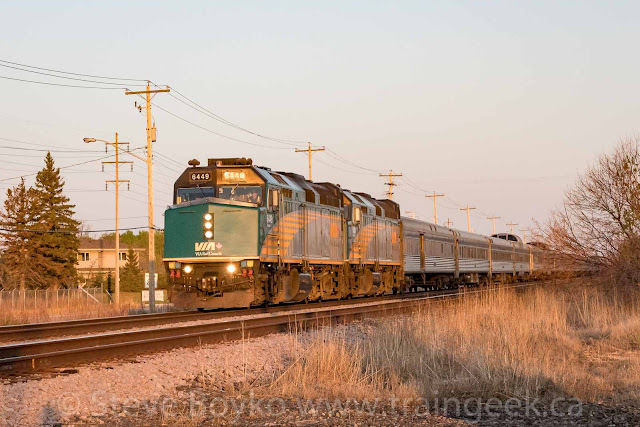 I drove along the train, looking for a DPU engine, but the two at the head end were the only locomotives on the train. At the highway 334 crossing, I photographed the train all stretched out along the prairie. 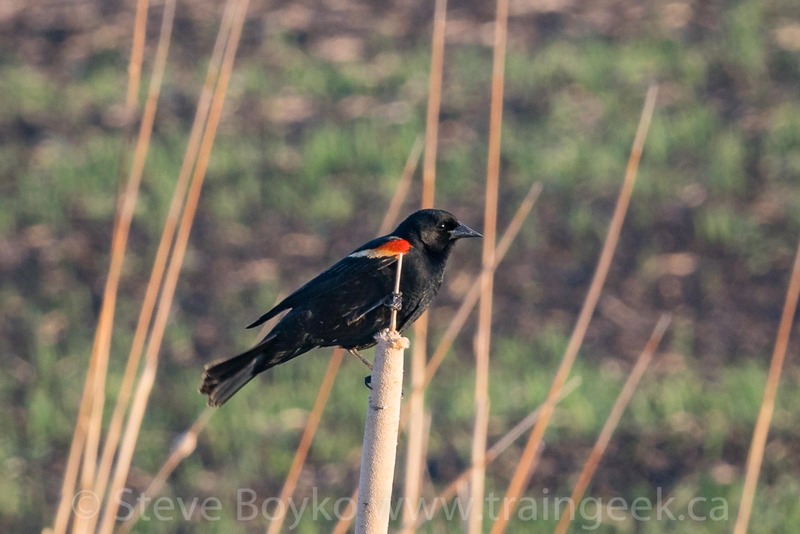 There were tons of red-winged blackbirds around, so I photographed a few of them too. They are very talkative and it was nice to hear them chirping and see them fluttering about. I also saw one of these - not sure what it is, but it's cute! I decided it was time to head home, so I hit the highway back to home and back to bed for a little while. It was a nice way to start off Victoria Day. Nice work on the going away shot of Via 2. I believe your unidentified bird photo is of an eastern meadowlark. A very pretty bird with a distinctive and recognizable song heard across the prairies. Nice photo, Steve. Love the sunrise photos, such a great light! Steve: Upon a closer look at the unidentified bird photo in your post, turns out it is actually a female red wing and not a meadowlark as I noted in a previous comment. Both species share similar features. My apologies to your readers.. Thanks for the bird identification, Morgan T! 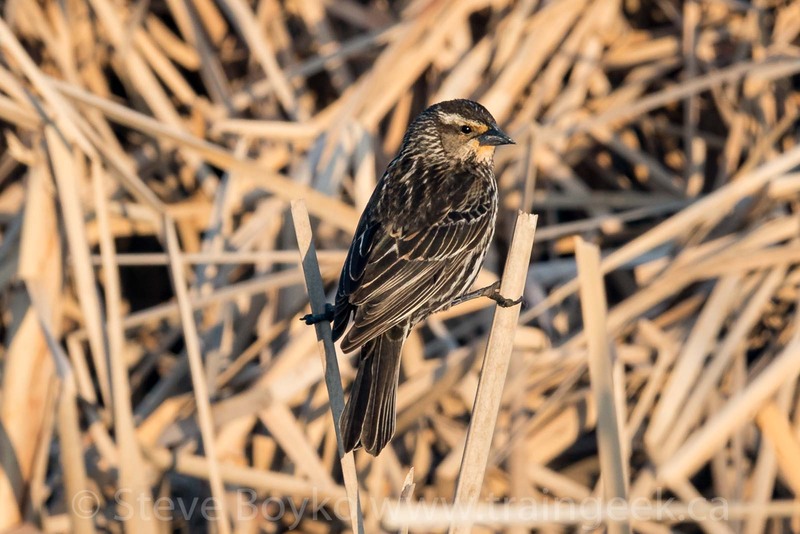 That makes sense that it was a female red-winged blackbird. I know my trains but not my birds, but I'm learning (slowly)! Thanks, Jenn! Sunrise and sunset are my favourite times to shoot.